Budget Saving School Holiday Family Tours! Experience Beijing during the school holidays with our fantastic family Seat-in Coach tour deal! 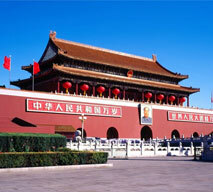 Our tours will whisk you and your family away to the famous Beijing tourist attractions! You can also check out our AirAsia Xi’an tours! For more information and terms and conditions get in contact with our tour advisors! Pick up the pax from Beijing Airport on Day2 early morning, transfer to hotel. Outside view National Grand Theater, Tian An Men Square, Forbidden City. Juyongguan Great Wall, Madian mosque, Wangfujing & Donghuamen Street. Photo Stop at Olympic Stadiums, Niujie Mosque, Muslim Super Market, Acrobatic Show. Place-LED Screen, Depart from Beijing departure to KUL. Wild Goose Pagoda square,Great Tang All Day Mall and Musical Fountain Square. Arrival Xian, Then check in hotel. Then have a good rest. Terra Cotta Warriors ,Small Wild Goose Pagoda. 1. 4 Adults can bring 2 children for free during the school holiday 1st Nov to 31st Dec 2014. 2. One travel agency only can get 4 children for free for same date package tour. 1. Child travelling for free must be under 12 years old. A copy of the child’s passport is required. 2. Child does not have own bed, if an extra bed is required costs will be incurred.